The social group Ninja Networks throws a massive party at Defcon almost every year. In the last few years that I’ve been involved, they’ve taken on larger scale projects and built custom badges for the exclusive Ninja Party. 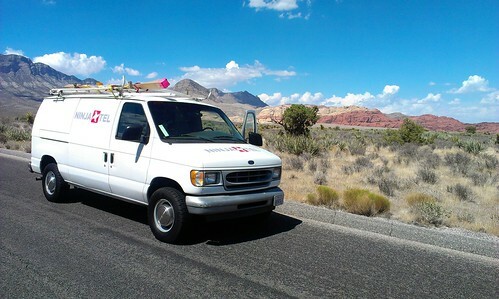 This year we took on our largest project yet: building an entire cellphone network. In 2009, Ninja Networks created their first electronic badge. It was a hand assembled 10 character LED display reminiscent of WarGames art style. For 2010, the badge was a game you could play against other badge holders and acquire quest items. This year’s badge was by far the largest undertaking. By building a phone network, project leads Matt Lewis (barkode) and Chris Nelson (cnelson) wanted to bring back the atmosphere of Defcon from 20 years ago: a world of phone hacking. Planning began almost immediately after Defcon 19 in 2011. The team coordinated with sponsors and began testing hardware. One of the first tests happened at Toorcon San Diego. We had acquired a USRP software defined radio and the clock necessary to do GSM. The next test happened in November at the Rio Convention Center in Las Vegas to determine if the hardware we had would be able to cover the entire convention area. In late February, we met in the new offices of Angel Valley Media in Sun Valley, CA; this would end up being where most of the final project work was completed. At that February meeting, we decided what server resources we would need and began brainstorming what services we would offer on the NinjaTel network. The NinjaTel phone is an HTC One V with a customized version of Android. 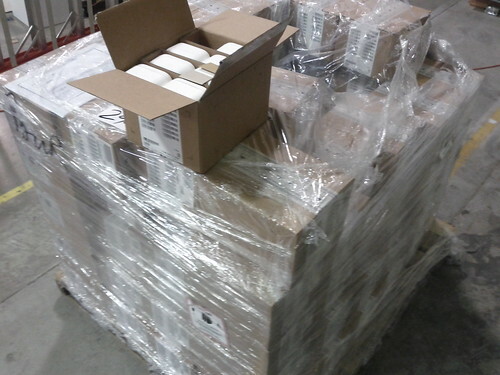 These 650 phones were provided by sponsor Qualcomm, specifically their AllJoyn group, an open-source proximity based communication technology. We received the phones very late. Less than two weeks before Defcon. This was thanks to litigation between Apple and HTC which kept our phones sitting at The Port of Los Angeles, held up by Customs. We laser engraved them all with our NinjaTel logo using a 36×24 Epilog. 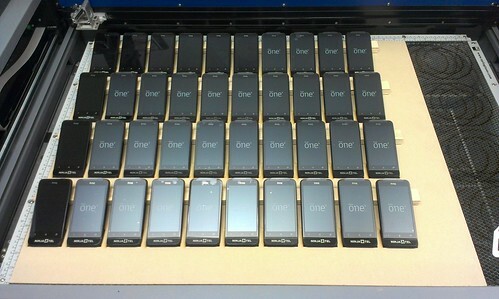 We could fit 40 phones in a custom jig. 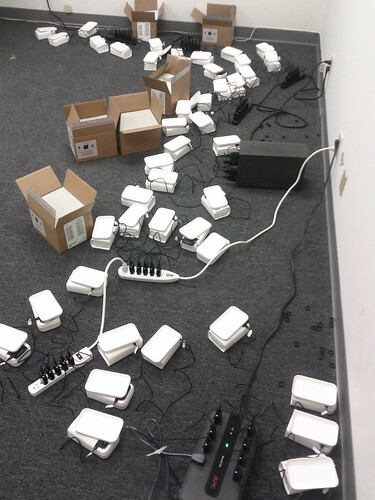 We also had to charge all of the phones so they would be usable out of the box. A full charge takes ~2.5 hours and we did it in batches of 96 phones. The custom firmware for the phones was built by Lookout with art assets from pinguino. The style is supposed to bring to mind what a smartphone would be if it was built 20 years ago, emulating things people were familiar with like yellow pages. It also had limited apps on the phone, to encourage users to play with phone network and not just the phone. The Verge has a video showing some of these services. 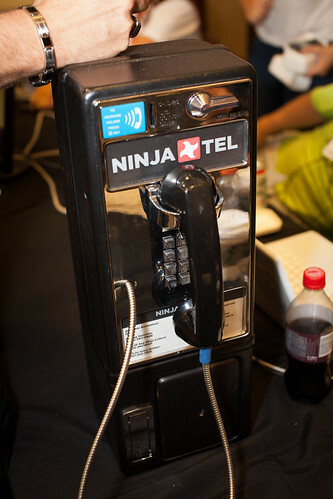 While Lookout have been good friends of ours and a sponsor of previous parties, they really went above and beyond this year making sure the NinjaTel phone happened and we can’t thank them enough. The centerpiece of this year’s project was the NinjaTel van. Built by Bob, Coleen, and me, it housed all the hardware to run the GSM network. The main radio is a USRP 2 connected to an amplifier, duplexer, and finally a 12 foot tall antenna on the roof. The radio components are cooled by a dedicated air conditioner in the back of the van. The rack contains servers running OpenBTS to handle the GSM communication and Asterisk to handle the call routing. There’s also a glowing operator desk to sit at while monitoring the network. Because we weren’t sure how much GSM capacity we’d have, the phones first attempt to make a SIP call over the Defcon wifi before attempting to connect via GSM. I’ve said it before, but this year wasn’t about the badge, it was about the network. We implemented many different services: call BoozeFone to get alcohol delivered, a paging service, classic 800 numbers for collect calling, and voice conferences all worked. We also had many Easter egg numbers: calling 867-5309 played the song “Jenny” back to you. Many of the voice prompts in the system along with the first call you get when you activate the phone were recorded by Pat Fleet, the voice of AT&T. 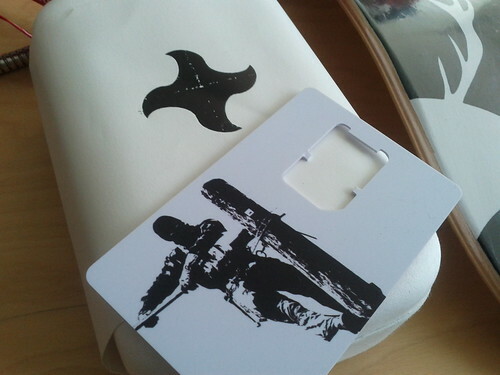 The full NinjaTel package included our custom SIM (only our phones and our SIMs were allowed on the network), the NinjaTel phone, a set of engravable shuriken dog tags, and an RFID wristband that let you bring a friend to the party. Besides finishing the van, my other major contribution to this project was the Ninja Cola machine. If you’re within range of the machine, you could make it dispense a soda… in theory. The Defcon wifi made it very hard to actually talk to the machine. We ended up using the machine as a shuttle bus stop marker where it got a pretty massive dent and its marquee stolen. All of the electronics are intact and I’ll do a separate post on how it works in the future. Jim Rennie (falconred) built a wireless payphone for the booth. It has an ATA, wireless bridge, and 12V battery inside. I brought the payphone home with me and will be switching it to a bluetooth ATA hopefully. This year’s Ninja Party took a lot of work from a lot of excellent people. The final product was thoroughly enjoyed by attendees and it was an incredible show piece for the final Ninja Party. You can read other people’s impressions at Ars Technica, The Verge, NBCNEWS.com, GigaOm, Cnet, Engadget, Phys.org, and The Wall Street Journal. 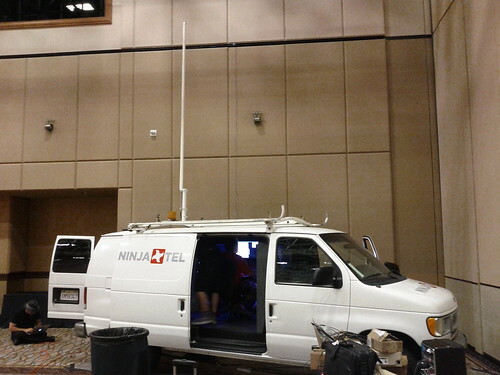 I’ve got some more pictures from NinjaTel and Defcon on Flickr.